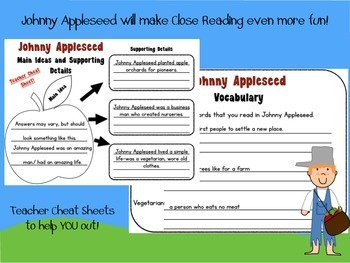 This Johnny Appleseed Close Read Pack will help you introduce close reading and main ideas and details. Or you can add it on to what you already do. 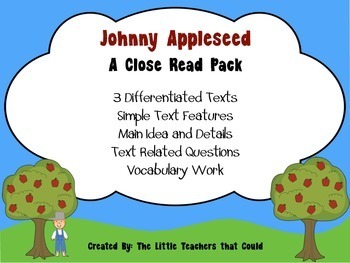 This pack comes with 3 differentiated texts that get increasingly more difficult for higher leveled readers. A graphic organizer will help you and your students find the main idea and supporting details. 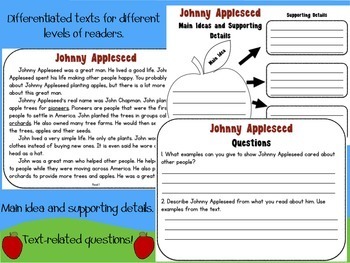 I have created text related questions that require higher order thinking and students to really use the text. Finally I added in a vocabulary piece to finish off the pack. 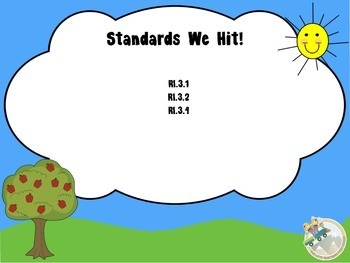 To make teaching and assessing quick and easy for you I created Teacher Cheat Sheets. More text features, sequence, compare/contrast, cause/effect and problem/solution close reads to come so stay tuned! Have fun!